I was the lucky winner of the door prize- two charm packs; and I also included 2 cuts from the Fabric Corner in my picture. Can you tell that I am dreaming of spring, based on my color choices?! At that meeting, I also received my bee blocks. These ladies did NOT disappoint! I am so thrilled. I can't wait to make more and put this baby together! Finally, here's a picture of the "library bag" I made for a friend. The pattern comes from Sandi Henderson's Bits and Pieces book. The cutting directions really confused me - I swear a measurement for the right panel was completely omitted and I didn't understand why she wanted the lining to measure larger than the outside! If any of you have insights on this, let me know. Quilt Blocks and another UFO complete! Above is the first block of the quilt-along I am participating in. I tried SO hard to be accurate with my 1/4" seam but the whole thing finished 12.25" square! (It is supposed to be 12.5"). Even with a 1/4" foot on my machine, I still have difficulty with getting that right! You can check all of the other blocks in the flickr pool. I love seeing everyone's different fabric choices. What has surprised me the most is the very country/calico choices people are using - which has made me realize a lot of traditional quilters are paying attention to the modern quilting world, while still following their own choices in fabric. Of course, this is a very traditional block- but the bloggers who are hosting the quilt along are known for their modern take on quilting. Next, here is the first block of my African Heart Dresden Plate quilt. I have had this idea in my head for at least 6 months and it has been slow going to bring it to fruition. Part of the problem was gathering the right fabrics - a bright royal blue and electric yellow were the challenging colors to find. I am having second thoughts about the background fabric (Kona White) and will bring this block to this Saturday's NEMQG meeting for some feedback. I pulled this completed UFO out of the dryer last night. 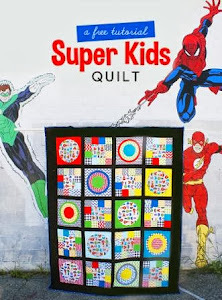 I had completed the quilt top almost exactly a year ago and wrote about it in this post. I really haven't liked it at all - but it does make a big difference to have quilted it and see it with some texture. I came really close to buying some backing for this quilt because I just didn't have anything big enough in my stash that matched - but I finally went with this Prints Charming plaid stripe from my stash. I think it goes with the quilt pretty well - although I was having second thoughts the whole time I was completing it. Another nice thing about the backing is that Prints Charming Free Spirit fabrics are printed on a very soft cotton - so it feels really nice. I have no idea what I am going to do with this quilt - I am starting to have a little pile of quilts with no destination/purpose. I am sure they will come in handy for future baby gifts and I am also contemplating on selling them at some point. Unfortunately, this post is going to be a lot of pictures of fabric - but I promise I have been sewing a lot. The project I completed over the weekend cannot be revealed until the recipient receives it and I have also been working on a boring, old UFO (picture at the end of post). But I am excited about what's on my sewing agenda for the next few weeks. 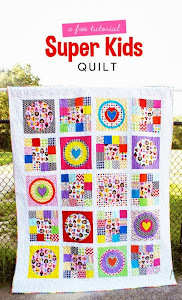 I made a spur of the moment decision yesterday to join the Blogger's Block-A-Palooza Quilt Along. I knew I should use my Hushabye FQ set I've had since the late summer. 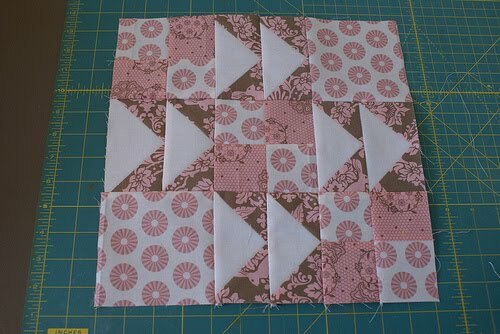 While watching Castle, I ironed all of the fat quarters last night and today I am going to complete the first block. I also rifled through my stash to pull fabrics for my upcoming turn in the Hip to Bee Square flickr group. I want to use these Far Far Away II fabrics as the focus. I was surprised that I had much more orange options than aqua. Are there any I should omit? I am going for a gender neutral theme - i.e. no florals. This is one of the oldest WIP's I have - and I only have about 1/4" of the binding left to hand-sew. Woohoo! I will show more pictures later. It's hard to know what to do for people when you know they are going through a hard time. It's easier to know what to do when that friend also lives in a poorly insulated Boston apartment and you know how to quilt. I have had these Amy Butler "Love" fabrics for about one year and it was finally time to use them! I went for a quicky and simple design and finished the whole thing in about two weeks. I have waited to blog about it's completion until I was able to give it to my friend. It's a simple patchwork design made of 8.5" squares - measuring @ 80" x 88". I used that "mistake" purchase of the Kona Cotton midnight to back the quilt, with a strip of a Love fabric down the middle. I quilted it with the "stitch in the ditch" method. I bound it in a honeycomb Midwest Modern fabric - the only piece of matching fabric that I had enough of to use. It matched pretty well and created the illusion of a stripe. I am so grateful for my friendship with this friend - we met on a volunteer abroad program to South Africa - a trip that happened almost 9 (!) years ago. We have gone so many different directions since then, but we always manage to "pick up where we left off" and I am so grateful for her. I hope that this quilt will bring her some extra warmth and also serve as a reminder of my gratitude for friendship. Thanks to everyone for their kind comments on the last several posts! I appreciate it so much when people take a minute to post something. I am trying to do better myself, this year, at commenting on people's blogs. We have received over 2 feet of snow here in New England in less than a week. It's great sewing, nap, and reading weather! But with a one year old, it's another story! I can't wait for spring. Anyway, I got around to making a bee block for the flickr Hip to Bee Square group. Janet sent Debbie Mumm coffee-themed fabrics and invited us to add our own fabrics (if we wished) and make whatever we wanted to as long as it was finished at 12.5" square. I had a hard time with this one but I think it came out nice and I liked being able to use some of my own scraps with Janet's fabrics. I quilted and bound this City Weekend quilt all in one evening - it was a fast finish. I really adore this fabric and can't wait to get to two larger sized quilts I have planned for the City Weekend fabrics that I still have. The quilt measures 41" x 32". I don't understand why I didn't buy a one yard cut of a City Weekend fabric when it was recently on sale for $4 per yard. It was difficult to find anything in my stash to back it with - but I finally settled on a random cut of blue kona in my small stash of solids. I had to edge it with some Kona Ash to make it wide enough - but it worked. Now I only have 7 UFO's to go! I keep wanting to start something new or just do a small project to give myself a break from the UFO's - but I keep telling myself, "You got yourself into this mess, now you have to get out of it." I do have to say that I am really enjoying the quilting of all the quilts (the basting, not so much), and it is so gratifying to complete these quilt tops that have been lying around for far too long. P.S. I just added a whole bunch of destash fabric to my etsy shop - time to clean out! Literally as I was sewing the binding onto this quilt top, I received a text from a favorite friend from college - letting me know she is having a girl! Of course, my husband had to tease me that I would probably make her something different anyway. I blogged about finishing this quilt on April 17, 2010, so obviously it's been a long time coming! The fabrics all came from my stash - with a Heather Ross gnome Spoonflower fabric being the center of each log cabin block. I particularly love the combination of pink and green. 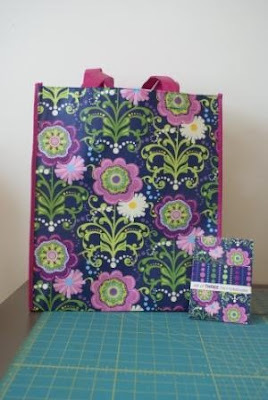 The quilt was backed with an Alexander Henry fabric I found in my stash and bound with a Mezzanine clover dot print. Wow- I am not very creative with trying to "name" my quilts! I am really itching to start some new projects but all of these UFO's (Un-Finished Objects) are like this nagging burden that I just want to be done with! All of my new Christmas fabric is particularly calling to me though! Tuesday night was spent basting this baby. Originally I had planned on doing a disappearring nine-patch, but I opted not to diturb the large-scale designs. I am also in a bit of a hurry to complete this for a friend who lives in a freezing apartment. I don't think it will be as appreciated if I give it to her in June. This is the other quilt top that I sewed with my friend over the weekend. It came out more boxy than I had anticipated, but I am liking the look of it. I made SO many blocks - I am debating on adding one more row..... This quilt is going to be a late graduation present for my sister. The pattern is very loosely based off a free pattern for a batik quilt that had been mailed to me - trying to entice me to subscribe to a magazine or something. Over the holidays, I came across an apron with an obvious Little Folks design at a local TJ Maxx. I bought it, careful to save the receipt, and emailed pictures of it to the designer, Anna Maria Horner. She immediately recognized it as a copy and soon accepted my offer to send it to her. Ms. Horner asked me if I could possibly send her two aprons (for legal purposes in pursuing the infringement) and I returned to the store. They didn't have another Little Folks copy, but instead had a copy of Sandi Henderson's green apple dot from her Farmer's Market collection. This is one of my most FAVORITE fabrics of all time, so of course I was going to recognize that! I bought it as well and Ms. Henderson quickly agreed for me to send it to her. I wrote Tula Pink but still have not received a response. I know that when Wal-Mart ripped off some of her Plume designs, she was not happy. The company that makes these aprons is called "Simply EnVogue" for their "Sweet Whispers" collection. There is really not much more information on the tags. I feel crazy that I know so much about fabric and could spot these copies so easily. 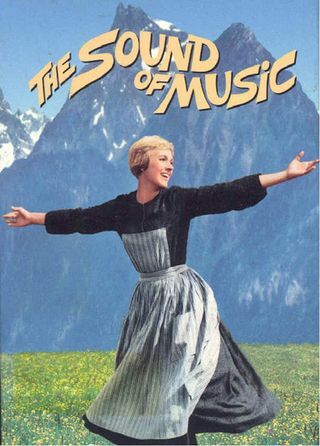 They also had another Michael Miller ripoff- but I had no idea who might have designed it, so I saved myself the trouble and didn't get it. The shameless stealing of other's hard work is upsetting and I do feel bad for these designers who are being robbed. A few months ago, I spotted a copy of an Amy Butler design from her Love collection - Paradise Garden. I emailed Amy and one of her assistants - never heard from Amy but her assistant did agree that it was a close match. Yep, my son is back to his pots and pans obsession. Never mind the fun and generous toys he received for Christmas. Who needs that stuff when you can play with a whisk and a rubber scraper? I actually grabbed one of his "toys" to rescue all of my Dresden plates that he enjoyed throwing on the floor. Despite my son's antics and penchant for skipping naps lately, I did accomplish a lot last week. I made roughly 180 dresden plates to go along with an African wax heart print. A very kind woman I met on flickr sent me the blue fabric you see in the left of this picture - it matches pretty well with my color scheme - I will soon be making some dresden plates out of it and then I am going to start to put together my blocks. I tackled a UFO and quilted it last night and this morning. I would've finished it last night except part of the back got folded under and quilted into the quilt in a bad way - so I had to spend the last hour with a seam ripper and I learned how to bury threads thanks to You-Tube. A local friend I have known for ages has repeatedly offered for me to come to her house and help me put together quilt blocks into quilt tops. I had complained to her about my lack of space and my child - two "issues" which really interferes with this step of making a quilt. I had these black/white/yellow quilt blocks sitting on a shelf for maybe two (!) years - so the day before I went to her house I finished them up (they had been framed squares and I had to sew them together in a half-square triangle technique) and I also prepared the blocks I had made for my sister over the summer. Unfortunately, I wasn't able to get great pictures today and eventually, I just gave up when Gregory was literally hurling a book at me so that I would read to him instead. But here's the black, white, and yellow quilt top - I will show pictures of the AB Love and my sister's green/blue ones later. I bought these fabrics ages ago and promptly pre-washed them. That was the last time that I have pre-washed designer fabrics - it's just not necessary and makes the fabrics SO wrinkly and annoying to work with. On a "materialistic" note - I used up some bookstore gift cards recently. Deciding on what to get was difficult - there are quite a lot of good options available right now for modern sewing books. The Sew Serendipity book is awesome - it has full size patterns included and seems like it will be useful to the novice clothes-seamstress. I am not gaga for everything in the Bits and Pieces book - but there are a few projects that I have my eye on. Confession time: Gregory about sent me over the edge yesterday and I indulged in some teensy retail therapy. We had to get out of the house and I headed over to a local traditional store that always sells it's fat quarters for $1.50 on every Monday. I was there for FOREVER because that store is a MESS and impossible to navigate a stroller around - PLUS - I was looking for fabrics that didn't scream "country." I was happy with the older Alexander Henry and Tula Pink fabrics I found - 1.5 yds worth for only $8.50. Am I the only one who buys fabric when they are stressed? Anyway- three quilt tops assembled, one quilt top quilted, and 180 dresden plates completed - not bad for one week! Despite Gregory's lack of naps - I still squeezed quite a bit in, on the rare times that he did sleep. The only problem is that now my unquilted quilt top number is up to 11 now! I am SO thrilled that I am FINALLY working on this quilt! I have been thinking about it for months. I have wanted to do a large quilt with dresdens and now I am finally making it happen! The AB Love quilt is finished now too - a post to come on that soon.